On April 23, Citrix announced its financial results for first quarter of fiscal year 2014, ended March 31, 2014. Net income registered a slight decrease with $56 million compared to $60 million of Q1 2013 while Non-GAAP results raised from $117 million for Q1 2013 to $119 million for Q1 2014. Our customers are looking for ways to embrace mobility, the cloud, IT consumerization and BYOD. Those needs are right in our sweet spot. As a leading provider in infrastructure and cloud services, we are uniquely positioned to help our customers deliver secure, managed, mobile workspaces. I’m pleased with our performance in Q1, and the strong start to the year, we saw growth in all our geographic markets, while delivering record cash flow from operations. Our results were driven by balanced growth across all three of our primary businesses: mobile and desktop, cloud networking, and SaaS. Citrix announced the availability of XenApp 7.5, a Windows app delivery solution that delivers apps as a secure mobile service to any device over any network, eliminating the cost and complexity of traditional app management. XenApp 7.5 app delivery technology is available as a stand-alone product or as a feature of XenDesktop 7.5 app and desktop delivery solution. The new XenApp 7.5 is built on the same FlexCast Management Architecture used in Citrix XenDesktop 7.5, making it easy for IT to manage apps and desktops from an integrated architecture that can easily be deployed both in the cloud and on-premises. With XenApp, IT can mobilize the workforce while reducing costs through centralized control and enhanced security by providing high performance anywhere access from any device. Only Citrix brings you the power to deliver apps and desktops to a wide range of use cases, empowering the workforce to safely and securely stay productive from anywhere. New Citrix XenApp 7.5 makes it simple to deliver any Windows app to an increasingly mobile workforce, while leveraging the cost saving and elasticity of hybrid clouds and the security of mobile device management. Citrix XenApp 7.5 is built on the new FlexCast management architecture that dramatically reduces the costs and complexity of virtualizing five generations of Windows apps and delivering them to users on any mobile, desktop or thin client device. Reduce the cost and disruption of application migration by hosting 5 generations of Windows apps from the same infrastructure. Speed the time to deploy corporate applications to mobile devices by securely hosting and then optimizing existing applications to be used by tablets and smartphones by taking advantage of new HDX mobile technology. The full power of AppDNA is now included with XenApp – AppDNA reduces the time to virtualize apps for mobile delivery by automating the labor required to test and remediate applications by up to 90%, saving thousands of person- hours during application migrations and on-going lifecycle management. Streamline IT operations by offering one console with scope and role delegated administration for configuration and deployment tasks built 100% on powershell for easy workflow scripting. 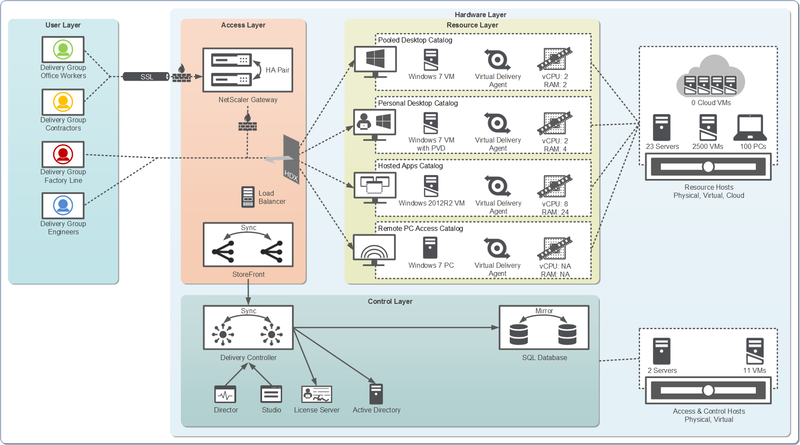 EdgeSight user experience monitoring built-in to Director and integrated with NetScaler HDX Insights ensuring critical performance data capture without putting additional load on the network. Enable enterprise IT to flex, grow, or transform their virtual app and desktop infrastructure without additional capex by leveraging the elasticity and economics of the world’s biggest and most powerful clouds. Provisioning to cloud infrastructure – Only XenDesktop can provision application or desktop workloads to private or public cloud infrastructure alongside a traditional virtual infrastructure deployment. Any cloud – Support through Amazon Web Services or any Citrix Cloud Platform-based public cloud or a private cloud built with Citrix Cloud Platform. Support through Windows Azure will be available in the future. Citrix is offering a limited time promotion offering free XenMobile MDM edition or 20% off of XenMobile Enterprise edition. Mobile Device Management is a technology that every organization should extend to their employees to ensure the full connectedness and potential of mobile devices without the risk of compromised networks or data loss. Web Interface support is extended for XenDesktop 7.5 allowing IT to maintain their existing Web Interface investment throughout the migration to the new FlexCast management architecture. With the new Citrix Connector for XenApp you can maximize your System Center Configuration Manager 2012 and 2012 R2 investments to reduce management costs. Use the connector to deploy applications across your Citrix environment, publish applications to all devices and take full advantage of Citrix image management features.